Home > Fabric Paint Crayons/ Art Media Supplies > Fabric paint crayons. 10 Swiss made professional paint crayons. Wonderful for use on fabric and heat set permanent. 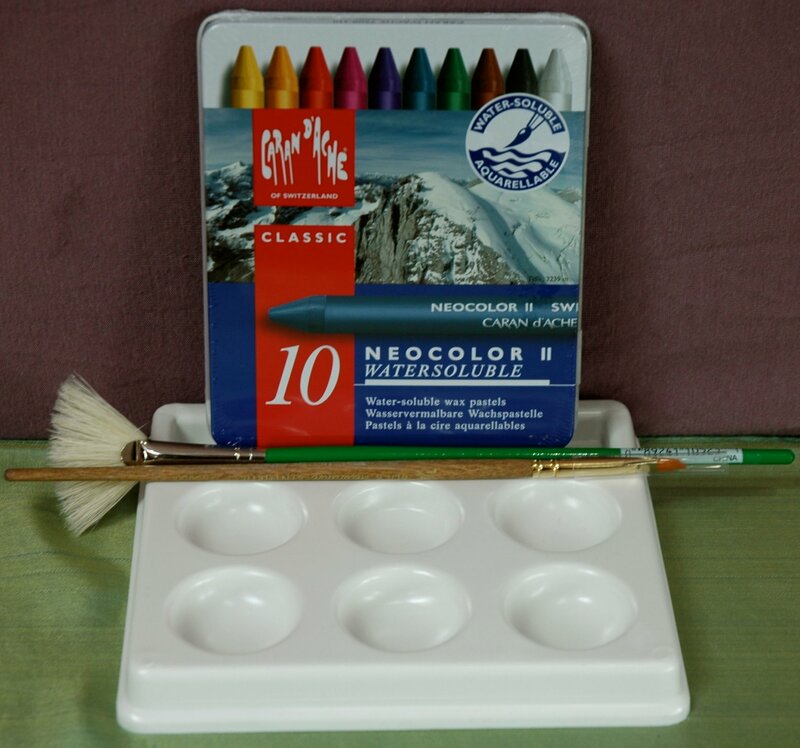 Set includes instructions, a 6 hole mixing palette, a fan brush for grasses trees and ripples and an angle brush for doing small details. Light fast and easy to use. These crayons do not dry out or get gummy like fabric paints. They last forever with very vivid pigments. You can paint right in your studio with no need for ventilation like dyes. I use these every day in my work. They sit right on my applique table, with a spray bottle of water so I can deepen a color, change the hue of a print or over-dye fabrics that I love the print or texture but the color is just not right. These crayons augment and increase your fabric stash. I have been using them for over 4 years on my competition quilts. Dry technique will allow you to paint very specific areas with control and no bleeding. Wet technique will allow you to use them like watercolors. Great for over dying and adding hi-lights, shadows, colors in water or sky/clouds. Use the angle brush for painting small details or adding natural hi-lights and shadows to your applique pieces. Video introduction to using these crayons. The full mini workshop is on my DVD. Watch your flowers, birds and pictorial details come alive with these simple to use paint crayons! !